PROF. DR. EDY TONNIZAM BIN MOHAMAD started his career as a geologist and geophysicist at OYO Corporation (Japan), Singapore after graduating from University of Malaya in 1993. 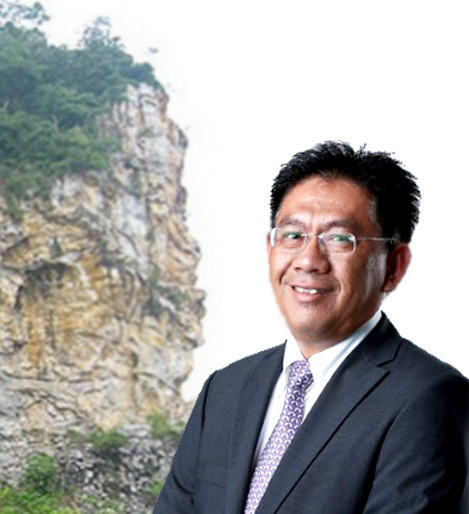 In 1995, he joined Sunway Group as a Regional Quarry Development Manager. In the year 2000, he joined UTM in the Faculty of Civil Engineering. As an academic, his interest revolves Tropical Geoengineering, Excavation, Quarrying, Rock Blasting, Rock Aquifer and Geoenvironment. He is a Registered Professional Geologist Malaysia (PG 81); Fellow of Institute of Quarrying, UK; Royal Fellow of Geologist Phillipines; National Fellow of Southeast Asia Disaster Prevention Institute (SEADPRI); a member of the International Association of Engineering Geologist (IAEG) and Southern Region Representative of Geological Society of Malaysia. He is a registered Environmental Impact Assessment Consultant with the Department of Environment, Malaysia since 2007 specializing in Quarrying, Mining, Geological and Rock Blasting. His work has received widespread recognition, including his appointment as the Chairman of Expert Panel (Geology) for Dewan Bahasa dan Pustaka Malaysia. He has been appointed as a Panelist for devising a National Policy Paper on Great Flood. He was also appointed by the Malaysia Public Work Department (JKR) to revise the National Road Work Specification (Excavation). In addition, he also provides support for Standards and Industrial Research Institute of Malaysia (SIRIM) in terms of his expertise in establishing standardised guidelines on earthquake. In Johor State, he has been appointed as Expert Panel on establishing Johor Sustainable Development Policy. To date he has led and become a researcher to more than 20 research projects. He writes, consults and speaks across the world on topics such as engineering geology, geohazard and sustainable development. His work has appeared in the reputable academic journals and has published several books and more than 200 journals and papers. He was also appointed as a reviewer by several International Journals. Moreover, he has also served as a consultant for several companies locally and internationally. Besides, he is actively involved in community engagement works. Based on his contributions, he received several awards and recognition. Some of his achievements include receiving the Excellent Award, Supervision Award, Media Award and Consultation Award.